Gold’s Gym CrossWalk 570 treadmill is a top quality treadmill that offers numerous innovative and intriguing features for a very attractive price. Increase your cardio benefits and workout entertainment with the Gold’s Gym CrossWalk 570. Equipped with all the extras, this treadmill will help you reach the finish line of weight loss. Burn 50% more calories with the CrossWalk Upper-Body Arms. The adjustable resistance will help increase your cardio benefits and tone your upper body while the redesigned grip will keep you comfortable. Next, stay motivated with your favorite music with the Compatible Music Port for iPod. Plug your MP3 player into the console and enjoy the built-in sound system. A spacious 20″ x 55″ treadbelt, Lifetime Frame Warranty, 25-Year Frame Warranty and QuickSelect controls all top off this incredible CrossWalk treadmill. ComfortShox Max Cushioning: Maximize your results, whether walking, jogging or running, with this extra-large cushion, helping you feel better during and after your workout. Dual-Grip PowerPulse Heart Rate Monitor: Make the most out of every workout by monitoring your heart rate with these sensors that are built into the handlebars to ensure you are in the right training zone for your goals. ClearView Backlit LCD Window: Perfectly clear and easy to read, the ClearView Display has a large viewing angle so no matter how tall or short you are, you can always keep track of your workout progress. It displays your time, speed, distance, incline, pulse and calories burned. CrossWalk Upper-Body Arms: Burn 50% more calories and increase your cardio benefits with CrossWalk upper-body arms, featuring adjustable resistance and a redesigned grip for increased comfort. Based on the ACSM’s formula for caloric expenditure of a 185 lb. male performing all workouts as prescribed. Compatible Music Port for iPod: Move to the beat of your favorite music with this built-in sound system. Plug your iPod or MP3 Player into the treadmill’s console for unbeatable sound quality. With the iPod resting on the console shelf, it’s within easy reach and leaves the controls right at your fingertips. 16 Personal Trainer Workouts: Burn fat, lose calories and stay motivated with Personal Trainer Workouts. These programs automatically adjust the speed and incline of the treadmill for increased intensity. Choose between aerobic, endurance, weight-loss or performance workouts and you’ll be on your way to success. Warranty: Lifetime Frame Warranty, 25-Year Motor Warranty and 1-Year Parts & Labor. The Gold’s Gym CrossWalk 570 treadmill is a well equipped and feature rich exercise solution that will enable you to get a top-quality and highly effective workout. The CrossWalk 570 treadmill from Gold’s Gym will have you getting fit and shedding those extra pounds in no time flat. Gold’s Gym fitness equipment is an excellent choice if you’re looking for a full-featured yet affordable home exercise solution that won’t break the bank. If you’re serious about getting into better shape and staying fit Gold’s Gym offers the affordable solution you’ve been looking for. What are you waiting for? 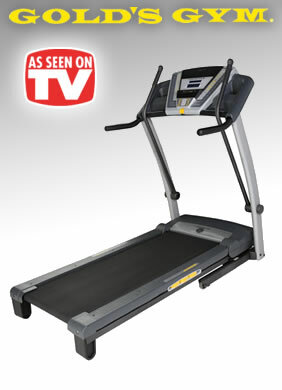 Order a Gold’s Gym CrossWalk 570 treadmill and get ready to watch those extra pounds disappear! Workout Warehouse is an authorized Gold’s Gym fitness equipment dealer and they stand behind every piece of exercise equipment that they sell and fully guarantee your satisfaction. Simply purchase your Gold’s Gym fitness machine (direct from Workout Warehouse) and use it for up to 30 days. If you’re not 100% satisfied with the results, simply contact Workout Warehouse’s customer service department for a Return Merchandise Authorization number and return the machine (including any accessories) in its original condition and packaging to receive a full refund, less a 10% restocking fee and the shipping & handling charges.